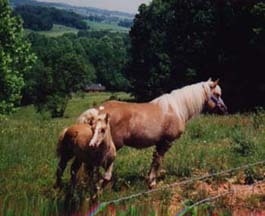 This Haflinger mare and her foal are demonstrating the breed's unique combination of beauty and tranquility. There's few things more beautiful than Haflingers out standing in their field. 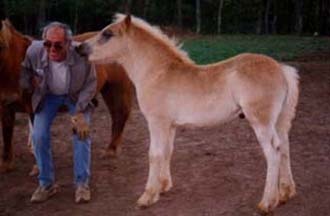 Isn't it nice to know that there are not just "horse whisperers" - there are "horse whisperer backers"? 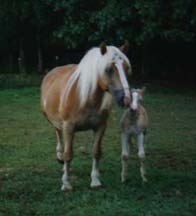 The Haflinger's sturdy physique and gentle, affectionate nature make the mares ideal mothers with a worthy but not hysterical attachment to their foals. Showing off the solidity that is her heritage. 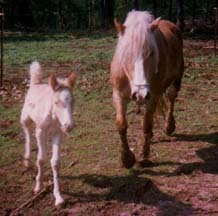 This is a 21-year-old mare with her new foal, and she looks pretty good for her age and will continue to do so and probably have a foal a year for several more years. Haflingers youngsters playing in the snow. As previously mentioned, Haflingers originated in the colder mountain areas of Austria, so they don't find dealing with snow any kind of problem. 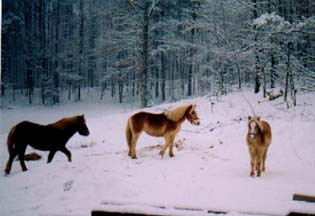 These Haflingers are enjoying the snow at the Howard's homestead in Tennessee.